A blog post – An attempt. Having been asked to write a guest post about my experience responding to Artes Mundi #6. I was full of vigour. Confident even. Then I realised the problem – how to keep this short when I am not sure even where to begin? It’s hard to quantify or qualify the exact narrative that will escape these fingertips at the best of times. So what is Response Time? You could say “The Response Time project is a 48 hour challenge for performance makers from a wide range of mediums to respond to the art, space and environment of a Gallery producing a performed response which is shared with an audience.” However, for me as an artist it’s the opportunity to share creatively, collaborate and engage with art. Why do I participate? Over many Responses Times I have had the pleasure to get to know some incredibly passionate and talented artists in many mediums. Also, I admire Sandra Bendelow, who has lovingly created a platform for emerging and established artists to collaborate through this Response Time project. This platform allows for new narratives about art that are both mental and physical. Why participate in a Response to Artes Mundi? Artes Mundi is a deeply important exhibition of works that are important to the culture of Wales. I could go on for hours about this, however I promised to make this blog post short. How did I feel getting there? Well I got there. The National Museum of Wales. I had found myself lost at the gaping large pillars hold the mouth of the temple. In a place of countless ideas, knowledge and secrets – where the walls whisper here as the space expands. Inside the time tested monument of history sat the contemporary – Artes Mundi #6, is of course a breath taking and meaningful exhibition. 3. I needed to research but wasted(?) at least two hours being overwhelmed. What kind of artist am I? I have my fingers firmly in many pies, I am however sadly not a pie-maker. Basically, I do everything and anything – but not pies. What did I choose to respond to? I chose to respond to the wonderful work of Renzo Martens and the Institute of Human Activites. How and why did I respond to this? Performance poetry was the only way I felt I could respond. The work was a beautiful, impacting and meaningful. The room was filled with chocolate sculptures – the sculptures were self portraits originally out of clay by plantation workers – then digitally printed. This work really resonated with me, not only on a sensory level (the smell was to put it bluntly – delicious). It impacted me, it was empowering communities, was deeply multi layered in meaning and was bitter-sweet. I admired this work, it made me consider my actions and way of life. Until my mouth is filled with bitter-sweet melancholy. Warm chocolate oozing across my cold teeth and sharp tongue. The luxurious earth rising through the soil. Vanilla scent of clay in each space of word. Here amongst the exotic forms – repackaged and redefined. Memories of communities forever stacked in minds eye. Now boxed and ready for transformation into a new age. I want to rummage my face in the kiss hold. Transmit digital waves of folkloric. Statues once analogue now binary. Now ready to pass through the medium of many. -A shared breath exhaling words once energy. Each molecule of water, across the thousand spaces in between share one moment. The distortion of contours that are and were landscape. Protect the cultures now reshaped by their own communities hands. And, Please do not touch the exhibits. Songs of melody form cultural understanding. The trees in humidity basked in light dancing like puppetry. Can I perform the dance of speculation? Alleviate my guilt into ethical promise. Chasing the moons edge on tide. Can I put a whole sculpture in my mouth until I choke and become the ground? Root the reach of their land shape. Infinite is this secondary glance within a spectrum of light – made of fruit. Many thanks to all at Artes Mundi, National Museum Wales, Scriptography and of course the marvellous people that came. Response Time will be responding again at the Turner House Gallery on Thursday 11th December. This entry was posted in Performed Response to Art on December 1, 2014 by Sandra Bendelow. How did you get involved with the Response project? I first got involved in the project about two years ago. At the time I was studying a level three national diploma in Performing Arts at Coleg Ceredigion. The course introduced me to all styles and disciplines of performance that I had never before considered having only experienced a brief period of youth theatre. One of my college friends (James Baker) became involved with the project and I became instantly swept up in his enthusiasm and got involved myself. Having begun to have developed a process for creating and performing my own theatre within the college environment, the opportunity to further explore my process and performance techniques in a more experimental space allowed me to establish myself as both a solo and collaborative performer. What are your favourite things and least favourite things about the response time project? The most rewarding aspect about the response time project is the chance to work with so many multi-disciplinary artists from such diverse backgrounds. As long as you are open to the process and other participants methods of working you can learn a lot from the artists you get to work with. I value any opportunity to work collaboratively and develop new ways of devising and performing, and this project gives me exactly that. The thing I love most about the response time project is the opportunity to open up a conversation between the arts. Too often we categorise art and separate the forms. I think the arts can be strengthened by the cross over and combining of forms. Our performances come as a result of a direct conversation with the art work in the space. The time limitations provide an interesting foundation for us to build our relationship with the work upon. Often our responses are led by an initial feeling or connection with a piece and the concept has little time to develop – this means there is no time for the concept to get over complicated and blur the communication of the piece. What we’re working with is raw honest responses. The most exciting development in the response time project is our recent visit to Cardiff to respond to Artes Mundi in the National Museum of Wales. I am so pleased with how well the project has been received and the amount of support and interest we are getting. It was such an incredible experience to leave the comfort of Aberystwyth and head off to the big city. The Artes Mundi response had a very interesting dynamic to it. Previously we have predominantly worked in Aberystwyth Gas Gallery – a space that now feels like home, a space we have become very comfortable and accepted in, and a foundation for our little community of performers. When working in the museum the pace change was instantly noticeable. No silence or stillness could be found in this space. The gallery where we were working welcomed a constant flow of rushed, confused, and disinterested people; some on lunch breaks, others looking for dinosaurs, and others shaking their heads and saying “this isn’t art”. Occasionally you would discover someone who genuinely engaged with the art work, took notice to the responses in the room, and respected the relationships that were building in the space. I found it challenging to find my feet in such a foreign place, making me realise I had become far too attached to the performance spaces and that my responses were being clouded by my fondness for the space. Artes Mundi brought the response time project back into focus for me, allowing me to return to the initial instinctive connection and respond honestly and purposefully to the art. However, once you commit to the project and the process of responding, accept the things you can’t change, you sort of get caught up in it – there’s a positive pace and energy to the group that always keeps me going. You have been involved in a few now, which has been your favourite and why? It’s very difficult to choose a favourite when each response time has been so different to the one before it. Each has a unique tone that is impermanent – arising from the art work and fading as the performers leave the space for the last time. That’s what’s so beautiful about this project! My first response is definitely my most memorable – a movement piece situated in a small storage room. I was responding to a relatively small piece, probably not a lot bigger than A4. The image depicted a young woman in a room with the light being cast behind her, turning her into a silhouette. The physical piece tried to explore this character in the picture, and explore her feelings about being in this space – the picture doesn’t suggest any freedom, it appears frozen in time, stuck forever. Responding to Black Smoke Rising was your idea, what was it about the exhibition that made you want to respond? It’s rare to find such emotionally charged art that is so demanding of its viewers – inviting us to engage with the space, the atmosphere, the structures in the space, and the emotional and political content of the pieces. In a way Tim Shaw’s Black Smoke Rising, is a performance in itself. The gallery has been transformed into an environment for its viewers to explore and navigate in an unconventional way. 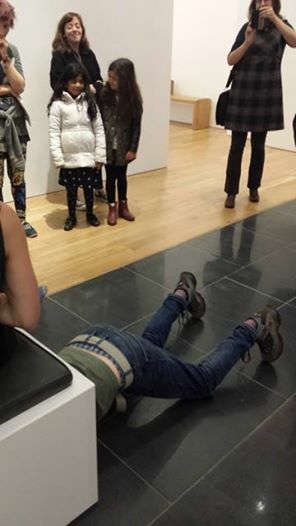 Usually when entering a gallery we are restricted by the behavioural expectations of the art viewer. I mean to say that our behaviour is pre-determined for us; we enter the space quietly (often never talking more loudly then a whisper), we stop and wait for a few seconds to make sure we have given an acceptable amount of attention to each piece, we do not touch the art, we do not get too close, we try and think critically and this shuts us off – viewing art has become a mechanised learnt response. I felt these expectations instantly fall away upon entering Black Smoke Rising. The sheer intensity of the environment shocked me out of this “correct way to view art,” and left me raw and vulnerable in the space; open to engage with the art in a very instinctive and honest way. That is what the response time project is about. This entry was posted in Performed Response to Art on November 14, 2014 by Sandra Bendelow. Following their recent response to Artes Mundi 6 at National Museum Cardiff the Response Time project will take on it’s biggest challenge yet, a response to Tim Shaw’s Black Smoke Rising at Aberystwyth Arts Centre. 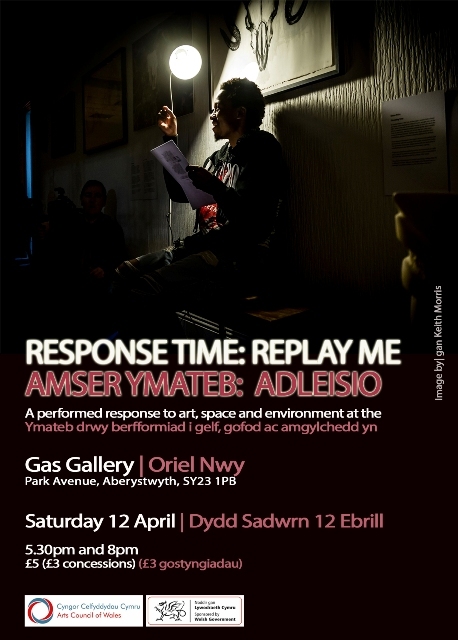 The Response Time project began as a pilot project to create performed response to art, space and environment at the Gas Gallery in Aberystwyth. In April 2014 it extended the 48 hour long project into a ten day residency at the gallery Adleisio: Replay Me which explored immediate responses and longer developed responses to the work of Annie Morgan Suganami’s exhibition alongside the development of previous work. In October it was invited to participate in the lunchtime performance series at Artes Mundi 6 and will be returning to Cardiff in December to respond to Artes Mundi 6 at Turner house Gallery in Penarth. Response Time allows young and emerging artists and performance makers to work alongside more experienced performance makers and curators from a variety of disciplines. It provides a vital opportunity for performance makers to gain performance experience and explore their own and others process of developing work. 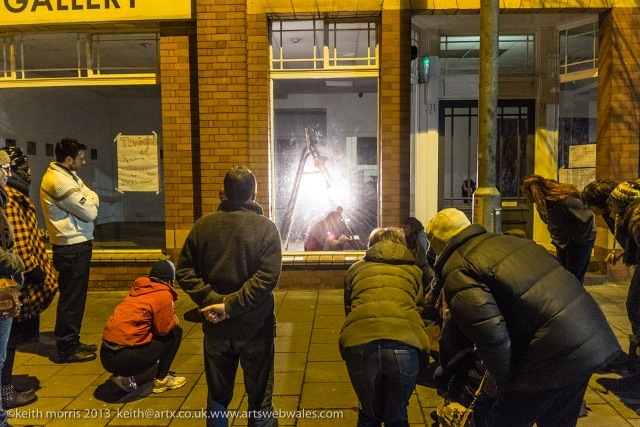 In 2015 Response Time will be looking for new gallery spaces throughout Wales in which to work on week-long residencies responding to art, space and environment. 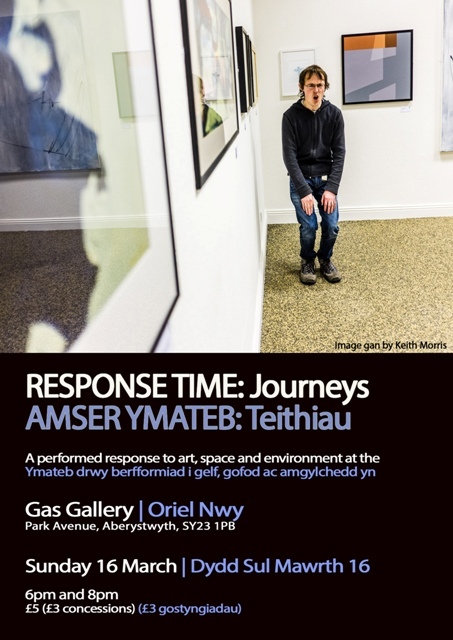 The Response Time project began as a pilot project to create performed response to art, space and environment at the Gas Gallery but within six months it has quickly become something far more integral and fundamental to both young, emerging artists in Aberystwyth and the Gas Gallery as a space from which creativity can be built. It is a unique project not only in Ceredigion but in Wales in that it draws together cross-artform and mutli-disciplinary artists and performance makers, giving them an ever-changing artistic and natural environment to which they can produce a performed response within a limited time-frame. At its heart lies a desire to provide young, emerging artists with a creative platform to develop their performance and process skills, a desire to give the opportunity for less experienced artists to work with more experienced artists to observe different creative process, a desire to create performance in unusual spaces and a desire to create a place where artists can meet and develop new collaborations and partnerships. The project also works to support the efforts of Celf Ceredigion Art in creating a centre of excellence for artists and for audiences for the arts in Ceredigion promoting the valuable ethos of creating cultural and creative life from empty buildings. Effectively Celf Ceredigion Art is working to make what happens inside the Gas Showroom as iconic as the outside. Each Response Time has started from an open call to participants – who have included writers, artists, film makers, photographers, actors, performance artists, poets, installations artists, storytellers. The range of people participating is growing whilst also creating a core of people who have participated multiple times. Each time returning participants have been encouraged to approach the project differently – to challenge themselves and their practice, exploring new collaborations and news ways of working. The event has been curated by a different guest curator each time – so far by a playwright, a playwright/performance maker, an installation artist and a performance artist. Curators have been drawn from previous participants allowing a curator to experience the project as a participant first. The curator’s role has been to start the project with a workshop encouraging people to engage with the art, space and environment of the Gas Gallery from a different perspective. The curator then nurtures each piece of work and the participants through the weekend, encouraging themes whilst allowing participants to produce their own work. The pieces are then curated into an hour of performance to explore the way the audience engages with the pieces as individual pieces and as an overall piece of integrated performance. This week Response Time will be resident in the Gas Gallery from 4th April until the 12th April producing three projects. Live and digital performed responses to the work of Annie Morgan Suganami. Participants will be given the whole week to respond to the work to explore what happens if the 48 hour restriction is removed and participants can explore the work in their own time-frame. Previous participants have been given the opportunity to re-examine work produced in previous response time project. They will be exploring themes which may have emerged over several responses alongside the question of whether their work can exist without the art it is responding to as a backdrop. A five-day resident collaboration between Sandra Bendelow, Lara Ward and Nick Jones exploring the text responses created through past responses by Sandra Bendelow whilst creating new responses together to the work of Annie Morgan Suganami. They will be placing words, sound and movement into the gallery and responding to the responses. They will be working with Cêt Haf, Milly Jackaw and Gwion Llyr. This entry was posted in Performed Response to Art on April 7, 2014 by Sandra Bendelow. Lara Ward will be curating this weekend’s Response Time: Journeys at the Gas Gallery. Though the weekend performance makers from all disciplines will be developing work in response to the art, space and environment at the Gas Gallery. The current exhibitions are Response to Place from Sculpture Cymru in the Downstairs Gallery and Barbara Matthews: Hidden Depths in the Upstairs Gallery. Audience will be invited to come along and view the hour long performance produced on Sunday 16th March at 6PM and 8PM. Lara Ward is a performer and maker, who works collaboratively to devise movement, character and text for theatre, film, installation and site-specific performance. 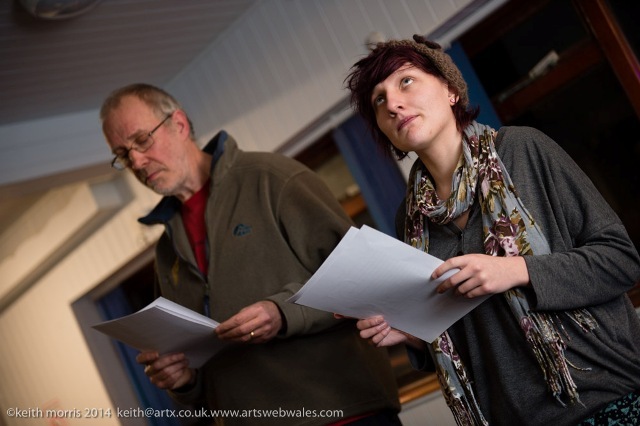 She has worked with many Wales based devising companies and independent artists. She has been a regular with Earthfall for five years and is currently devising for Chelsea Hotel, which tours in Spring 2013. As a choreographer, she has conceived, directed and edited a short dance film ‘Paper State’, exploring the ritual of waiting, which screened at Chapter Arts Centre in 2010, worked as movement director for Theatr Chorea’s Oratorium project inŁódź, Poland in 2011 and has co-choreographed residential site-specific and stage productions for Earthfall Education and Outreach. In 2012 she undertook many site specific projects, including a collaboration with Chloe Loftus, creating ‘pop up’ performances for the Blue Lagoon Festival in Pembrokeshire and a photographic project with Keith Morris, at South Beach, Aberystwyth. 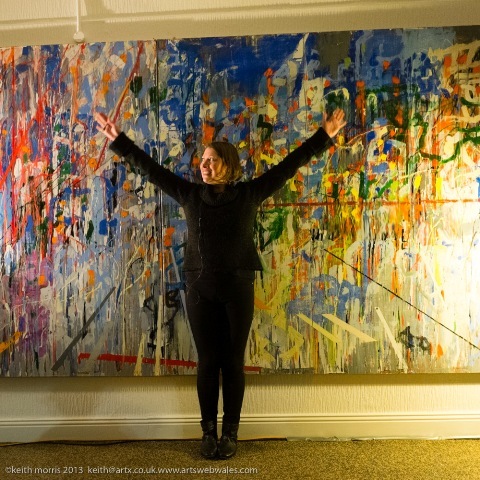 Whilst working as Community Dance Practitioner for Denbighshire, North Wales, she was a core member of the Dance Collective, performing site-specific improvised works and gallery collaborations with visual artists Femke Van Gent and Carlos Cortez. During three years work in Cheshire, she managed and developed a partnership between British Waterways, the Borough Council, and local colleges, to produce a waterways sculpture commission which won a British Urban Regeneration Award for best community project in 2006. This entry was posted in Performed Response to Art and tagged Barbara Matthews, dance, Earthfall, installation, Lara Ward, Sculpture Cymru, Site specific on March 14, 2014 by Sandra Bendelow. As always we are looking for participants who wish to be involved in any way – as writers, actors, collaborators, creators, makers, instigators, directors or a combination of all or any of those. The pieces vary from performance art to short narrative plays. You can work alone or collaborate with others. There is no restriction on style, theme, genre – this is a space to create and play. The work produced will be shared with audiences on Sunday 16th March for two performances at 6PM and 8PM. Tickets £5 (£3). If you would like more information or are interested in participating this or future Response Time challenges as either an artist, a writer, performer or director contact scriptographyproductions@gmail.com We have more scheduled through the year and also we have new spaces and places we will be exploring later this year. 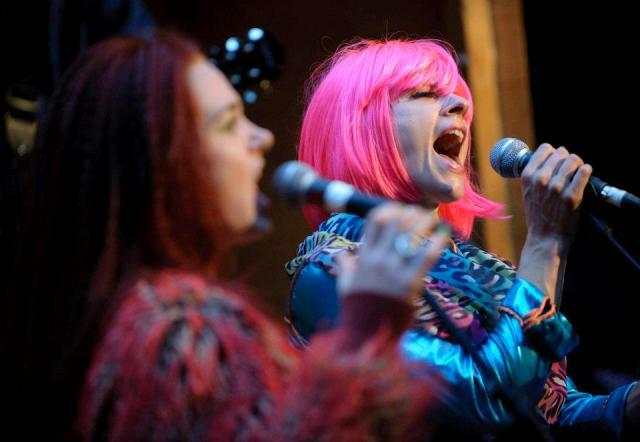 The challenges offer the opportunity to gain experience developing work for performance to the public and also offers the exciting and unique opportunity to collaborate across disciplines and art-forms. We work to provide a safe, supportive and fun environment for everyone involved. This entry was posted in Performed Response to Art on March 5, 2014 by Sandra Bendelow.